Just as your interests change in the course of your life, so does your taste in art. Do not shy away from redecorating the walls of your law firm or dining room again and again with handmade oil or acrylic paintings that suit your current mood. 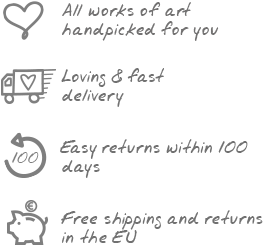 At KunstLoft you can find something exclusive that respond to the newest trends in canvas paintings – often they are from a limited edition, so get them before someone else does! Changes are what make life interesting: remember this motto when you are decorating your interior spaces, so do what you feel like at the time! Have confidence in these conspicuous art objects and you will find the inspirations you need in our online shop. Would you like to be different from your competitors by hanging extravagant paintings in your holiday home? Then you will definitely find something perfect from our great selection of motifs! Make confident statements on your personal style and decor with our high quality decorations and introduce your guests and visitors to the contemporary trends. Apart from handmade canvas paintings, wall sculptures in a noble coppertone can also add a certain something to your rooms. These shiny eye-catchers strike the eye immediately and their magic lingers in the air. You can show off your good sense for contemporary art with new canvas paintings. Are you looking for a finishing touch for your cosy living room? What about an acrylic painting in Shabby Chic style which, with its warm colours and bright natural tones, finds a sweet spot in between something old, something new and something curious? Or would you rather express your rebellious nature and opt for a motif in an elegant black and white tone, which would create a striking contrast with the rest of your furniture? As the most classic colour combination ever, black and white cannot hide their charms in any painting size, but are especially impressive when painted in an XXL format. Take your time browsing our online shop and choose your favourite new artwork carefully. You can buy the latest trends in abstract and modern handmade canvas paintings at KunstLoft. We use a trained eye to look only for acrylic paintings on canvas with exclusive motifs that we are 100% convinced by. Don't hesitate and beautify your home.